Life on a large university campus is busy all year, but seemingly more so during the winter and spring months. Classes, exams, meetings, numerous campus events, snowstorms, bitter cold and the excitement leading up to May commencement ceremonies contribute to an often-frenetic atmosphere. That is why I am glad our Founders Day celebration takes place each February. It gives us a chance to pause and reflect on the history of Illinois State University and to honor the many accomplishments of faculty, staff, students, and alumni. As Illinois State marks its 162nd year as Illinois’s first public university, we remember those who helped found this institution: Abraham Lincoln, Jesse Fell and Charles Hovey, to name a few. But the honors and awards we present during the Founders Day Convocation draw us back to the present, assure us that Illinois State remains vibrant and relevant, and remind us there is so much more to be done. This decade has not been kind to Illinois public higher education. Many of our sister institutions have experienced significant enrollment declines and the associated financial misfortunes. Political and economic challenges have pushed many universities to the brink, with the prospects for full recovery long and uncertain. Illinois State is in a fortunate — and enviable — position of strength and stability. That is something our campus community never takes for granted. Our enrollment has remained steady over two unsteady decades, averaging more than 20,500 students each year. We have kept college investment affordable. In fact, Illinois State’s tuition and fee package remains in the lower half of Illinois’ public university costs. That affordability is reflected in our student loan default rate of 3 percent, which is 8 percent below the national average. Our national rankings also have remained strong and stable, with graduation and retention rates in the top 10 percent in the country and a top 100 rating in U.S. News and World Report’s ranking of Best National Universities. We continue as a top military-friendly university, and the Chronicle of Higher Education has ranked Illinois State as a Great College to Work For. Our near-term future looks as bright as our near-term past. Despite a large fall graduating class, we have a strong enrollment this spring semester of 19,364 students, a large majority of whom hail from Illinois. Meanwhile, our partnership with INTO ISU resulted in 72 new students this spring from seven different countries. Looking to recruiting for next fall, applications from first-time in college students and transfer applications are both running well above last year. Admission of those students, who have a strong academic profile, also is ahead of last year’s numbers. I am pleased to report that the diversity of our admitted students continues to increase. The number of African American, Latino/Latina, and Asian students admitted for this coming fall exceeds last year’s success. A growing number of international students also are recognizing Illinois State’s reputation for excellence. I am grateful that our state legislative leaders passed a full budget for this fiscal year, and thankful for the support of our local legislative contingent, including State Rep. Dan Brady and state Sens. Bill Brady and Jason Barickman. I am encouraged by the fact that Gov. J.B. Pritzker has proposed an increase in funding for higher education along with more money for MAP grants and the AIM HIGH scholarship program for the coming fiscal year. I will continue to advocate for a fair and equitable funding formula for Illinois universities. Despite Illinois State’s continued strong enrollment and proven track record of educating in-state students, the university annually falls victim to an archaic funding model that financially punishes our success. Still, we have a multitude of reasons to be thankful, and Illinois State’s future is bright. The university has a strong commitment to academic excellence, student achievement, a careful stewardship of resources, and service to the public. The ongoing support of the Bloomington-Normal and larger McLean County community plays a vital role in Illinois State’s success story. I believe our university founders would be proud of Illinois State’s accomplishments and enthusiastic about its future. 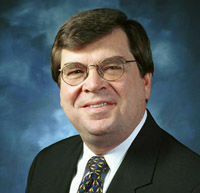 Dietz is president of Illinois State University in Normal.